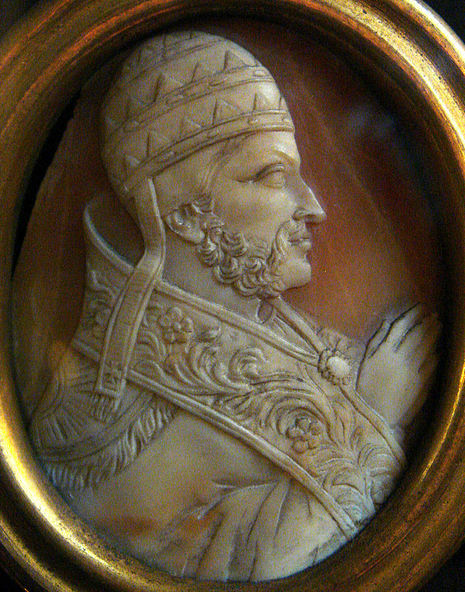 Pope Nicholas III (Rome, 1210/1220 – August 22, 1280), born Giovanni Gaetano Orsini, Pope from November 25, 1277 to his death in 1280, was a Roman nobleman who had served under eight Popes, been made cardinal-deacon of St. Nicola in carcere Tulliano by Pope Innocent IV (1243–54), protector of the Franciscans by Pope Alexander IV (1254–61), inquisitor-general by Pope Urban IV (1261–64), and succeeded Pope John XXI (1276–77), largely through family influence, after a six-months' vacancy in the Holy See. Nicholas' brief pontificate was marked by several important events. A born politician, he greatly strengthened the papal position in Italy. 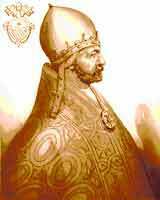 He concluded a concordat with Rudolph I of Habsburg (1273–91) in May 1278, by which the Romagna and the exarchate of Ravenna were guaranteed to the Pope. According to the chronist Bartholomew of Lucca he discussed with Rudolph, in general terms at least, splitting the German Empire into four separate kingdoms - Lombardy, Burgundy, Tuscia and Germany, where Rudolph's kingdom would be made hereditary in addition to himself becoming emperor. In July 1278 Nicholas III issued an epoch-making constitution for the government of Rome, which forbade foreigners taking civil office. Nicholas' father had been a personal friend of Francis of Assisi, and he himself had to focus much of his attention on the Franciscan order. He issued the bull Exiit qui seminat on 14 August 1279 to settle the strife within the order between the parties of strict and loose observance. He repaired the Lateran Palace and the Vatican at enormous cost, and erected a beautiful country house at Soriano near Viterbo, where he died of a cardiovascular event (the sources differ on whether it was a heart attack or a stroke). Nicholas III, though a man of learning noted for his strength of character, was known for his excessive nepotism. He elevated three of his closest relatives to the cardinalate, and gave others important positions. This nepotism was lampooned both by Dante and in contemporary cartoon depicting the Pope in his fine robes and three "little bears" (orsatti) hanging on below, a pun on the family name. His alleged discussions with king Rudolph could be interpreted as an attempt to found principalities for his nephews and other relations. Dante in The Inferno (The Divine Comedy) talks briefly to Pope Nicholas III, who was condemned to spend eternity in the Third Bolgia of the Eighth Circle of Hell, reserved for those who committed Simony, the ecclesiastical crime and personal sin of paying for offices or positions in the hierarchy of a church. In Dante's story, the Simoniacs are placed head-first in holes, flames burning on the soles of their feet (Canto XIX). In these pits, Nicholas III was the chief sinner, which is demonstrated by the height of the flames on his feet. At first he mistakes Dante for Pope Boniface VIII. When the confusion is cleared up, Nicholas informs Dante that he foresees the damnation (for simony) of not only Boniface VIII but Pope Clement V, an even more corrupt pope, as well.